I really enjoyed the first two games in Frozenbyte's Trine series, and I've been very much looking forward to the release of the next one, Trine 3: The Artifacts of Power. So I felt a little awkward when I discovered, really quite recently, that it actually came out of Early Access today. 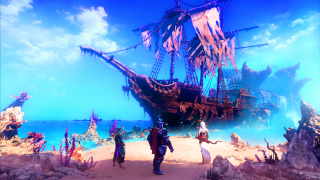 Trine 3 is the first game in the series to feature 3D gameplay, as seen in the launch trailer and screens below. It's a big change, which is why the game had a relatively lengthy Early Access period. "Trine 3 is our first move towards 3D-gameplay in the Trine series, so we wanted to get in touch with our player-base in an early enough phase to collect feedback on the new gameplay features, so we can tweak those into the right direction," the studio said in April. "Early Access can hopefully provide us with lots of players willing to do this." Trine 3, like the previous games in the series (once you've updated the original to the Enchanted Edition, that is), supports online and local co-op multiplayer for up to three players. The current release is Windows only, but Frozenbyte said it hopes to have Linux and Mac editions out before the end of the year. It's also on sale, slightly, for ten percent off its regular $22/£16 price, as are its predecessors, although they've been marked down 85 percent, dropping them to $2 for Trine and $3 for Trine 2: The Complete Story.